LATTICE :: One of BRAHMS MOUNT's softest blankets. cotton/wool blend Made in the U.S.A.
DEWOOLFSON's - Warmer than cotton and cooler than a down comforter - white down blanket with satin binding is the ideal transitional layer. Washable. Silk Puff Silk filled & cotton voile covered With its expanded loop stitching, the silk in our Silk Puff comforter is allowed to loft like down. Inside, the silk forms a batting that clings to the cotton fabric, which prevents bunching and shifting. And, when used inside your cotton duvet cover, this comforter is guaranteed to stay in place. 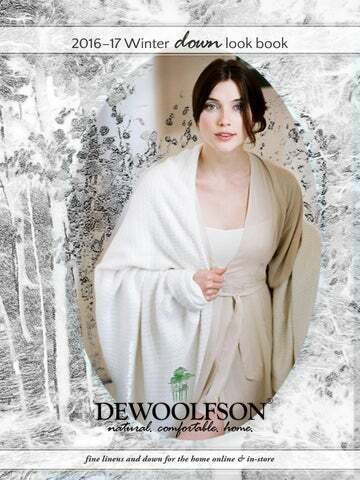 DEWOOLFSON LINENS 9452 NC Highway 105 S. Banner Elk, NC 28604 U.S.A.
Don't let a chill in the air prevent you from having a perfect night's sleep every night!